Why would you create a customer-centric content marketing strategy? We are in a customer-centric market that demands we know and serve our customers better than the competition. And while of course, every company wants to provide a product or service that serves their customers well, an Econsultancy study found that “only one in three consumers believe that their favorite company understands them.” That means, 60% of your customers feel as though you don’t know them and aren’t serving their needs at all. If we’re going to change the statistics, and the way our customers feel, we need to listen to their feedback and support their needs at every touchpoint. A customer-centric content marketing strategy uses the customer’s feedback, words, and questions as the framework for the content and is the best way to ensure that your company is supporting current and potential customers. Creating a strategy that focuses on building a relationship with customers and helping them through their buyer journey will ensure that every piece of content you publish is helpful, meaningful, relevant, and necessary for the customer, not just your company. It’s impossible to create a customer-centric content marketing strategy without feedback from your customers. Feedback creates a deeper understanding of your customers. It allows you to understand how they felt while searching for your product/service. Why they need your product/service. Why they chose your company over the competition. What struggles have they experienced since purchasing. These insights will create the framework for the entire customer-centric content marketing strategy. Des Traynor from Intercom gave an impressive talk at WebSummt 2018. One of his slides is the perfect example of the importance of a customer-centric content marketing strategy. Starting with happy, paying customers is the best way to ensure you gain more happy, paying customers and grow every year. There are numerous ways to collect valuable feedback from your customers. Getting on the phone or scheduling 1:1 conversations with your customers is a great way to get valuable feedback on how your customers are experiencing your product/service. And non-sales conversations are directly linked to growth. In fact, a ProfitWell study found that when a company performed at least 10 non-sales customer conversations a month they saw 30% growth annually. The piece of data that is most impressive to me, and surprising to my clients, is that it only takes a few conversations to see patterns emerge and learn incredible insights. Keep the conversation on the customer’s buying experience. Encourage them to share how certain things made them feel and why they made the decisions they did. No selling. This is not the time to upsell the customer or to try to solve their problems. These conversations are not about making the customer feel a certain way or encouraging them to upgrade their subscription. If you try to sell at all, you will immediately lose the customer’s trust and without their trust, the feedback will not be as valuable. Your most powerful question is “why?” After a customer answers a question ask them why and you’ll gain deeper insights into their motivations. Get comfortable with awkward silences. Our natural inclination is to fill all the awkward silences and long pauses with our comments or suggestions in order to help the customer along, but allowing the customer to be the one to respond first gives them the opportunity to think through their response and provide deeper insights. Allow time for chit-chat. The most important aspect of these conversations is that the customer will trust you and open up to you. A Harvard Business School study found that a few minutes of chit-chat and camaraderie is very effective at helping people open up. Reward them for their time. It’s nice to be appreciated, especially when you have gone above and beyond for someone. That is exactly what your customers have done for you. Be sure to thank them in some way for their time. Maybe it’s a donation to their favorite charity or a coffee house gift card or a discount on their services. Either way, make sure it’s valuable to your customer. Surveys are the easiest way to automate feedback. When using surveys for feedback you want to make sure they have the following capabilities. You can ask unique questions. It’s important that the survey can be customized to meet your individual needs and ask questions that will help you better understand your customers. Fits your brand. Your survey should look like it’s coming from you and your company, not the survey company. Make sure you can have your logo and company name clearly on the survey. Rewards customers for their participation. This is an important piece for surveys too. Giving back to your customers shows that you appreciate their feedback and the time they invested. Collects feedback in a variety of ways. Your communication should be convenient for the customers. If they are receiving a product in the mail it makes sense to have a printable PDF that encourages feedback, or if they do most of their communications through text message you want to be able to text them the survey. Having a variety of options to provide your customers a survey shows that you are catering this process to be the most convenient for them, not just for you. The questions match the customer’s experience. You wouldn’t want to ask a customer who left a 0 start review the same questions as someone who left 5 stars. It’s obvious their experiences and expectations were completely different. Creating a survey that is specific to that customer’s review is another step in building trust and engagement. You receive powerful, accurate, and easy to understand analytics. The data is what this is all about. If you don’t have access or don’t understand the analytics than the surveys are a waste of everyone’s time. Once you’ve collected your feedback it’s important that you organize it in a way that you and your team can use it. I like to find the relational keywords. Those are the words your customers use repeatedly to describe or explain their relationship with your product/service. As soon as you noticed the same words being repeated- write them down. I organize them according to the stage of the buyer journey they were describing. This helps me create content at every stage of the funnel that will resonate with customers. They will clearly understand the content and it will do a better job helping through the buying and retaining process. Here’s a very simple example of my relational keyword database. 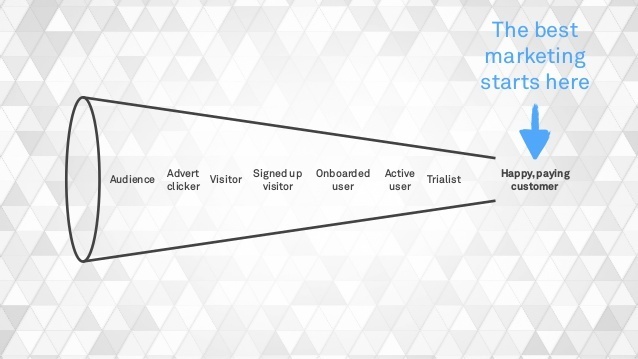 I fill in the most common words through each stage of the user journey. The biggest difference between a regular content marketing strategy and a customer-centric content marketing strategy is that you use customer feedback in addition to keyword research. The term I use to refer to the customer’s specific word choice is relational keywords. These are the words they used to describe their joys and pain points with your company or product. Combining relational keywords with SEO keywords means you’re going to create content that your future, potential, and current customers need in order to convert and be nurtured throughout their journeys. Before you set out to do something it’s critical that you know what you want to achieve. Setting goals will help you focus on the right metrics and kinds of content to create. Using your relational keyword database, create a list of questions and concerns your customers commonly asked or shared. Their repeated questions and concerns are a great jumping off point for blog post topics. This will ensure you have content that nurtures your current customers and addresses their concerns and answers their questions. Retention is one of the most difficult aspects for SaaS companies, so it’s important that your content plays a role in helping your customers feel understood and nurtured throughout their user journey. SEO keyword research is another important factor in the research process. You want to make sure that you’re ranking for terms that people are actually searching for. There are many great SEO tools and guides such as this one from Backlinko, and this one from Moz, and this one from Hubspot. Using SEO best practices, create the list of topics you’d like to rank for. This can be done on a simple spreadsheet doc, there’s no need to get fancy If you don’t want to. Once you’ve listed relevant topics to your customers and your industry, break those down into keywords. You want your list to cover all the aspects of one topic. Think of your blog as the Wikipedia of your industry and cover all the relevant information about that one topic. Here’s a simple example of a spreadsheet I use. Your content calendar assigns specific pieces to be written and published at a specific time. When looking at creating your content calendar it’s a good idea to keep conference dates, national and religious holidays, and important dates within your company on your calendar. These can often be helpful when deciding what posts to publish when. For instance, you wouldn’t want to publish a Holiday Buyer’s Guide on December 26th. Promotion is often the piece that is left out of content strategies. When you’re creating a customer-centric content marketing strategy, promote your content on the social platforms that your customers use most often. Share the blog post with your email list and the customers it benefits most. If you have a community of customers (and you should!) share it with them. Promote your pieces in a cycle, because there’s no reason a post should only be promoted once. Creating a customer-centric content strategy will help you use your blog as a tool to build genuine trust and relationships with your future and current customers. It will be the place your customers come to learn something new about your company or product, or the place that helps them answer their questions. It will be where your potential customers fall in love with your brand and tone of voice and company culture. When your content’s focus is on knowing your customers and serving them well, your content will be the most important piece of your overall marketing strategy. Adrienne helps SaaS companies create a better experience for their customers which unlocks growth and profit. She’s a customer experience strategist and content marketer with a passion for serving customers and creating communities. Her motto is a little bit of human goes a long way. Find her at https://adriennenakohl.com and connect with her on LinkedIn or on Twitter.